Next month I’ll be heading off for a few weeks to assist on a research project investigating the behavioural response of humpback whales to seismic surveys. Although we’ll be returning to shore each night, there will be a fair bit of time bouncing around on the continental shelf off Western Australia. So, to get all my health and safety up to date, this week I’ve been attending courses in sea survival and first aid. On Wednesday, Angela and I were off to ERGT Australia to attend their Apply Offshore Facility Abandonment and Sea Survival Procedures (FAB) course. This involved quite a bit of apprehension. We had heard various horror stories from BOSIET veterans about jumping from heights into a pool and, after an unfortunate adventure a few years ago that involved me taking the shortest route down a cliff face, I wasn’t particularly keen on jumping from anywhere. Plus the idea of floundering around in the water making pratts of ourselves infront of a bunch of tough male riggers wasn’t exactly appealing! 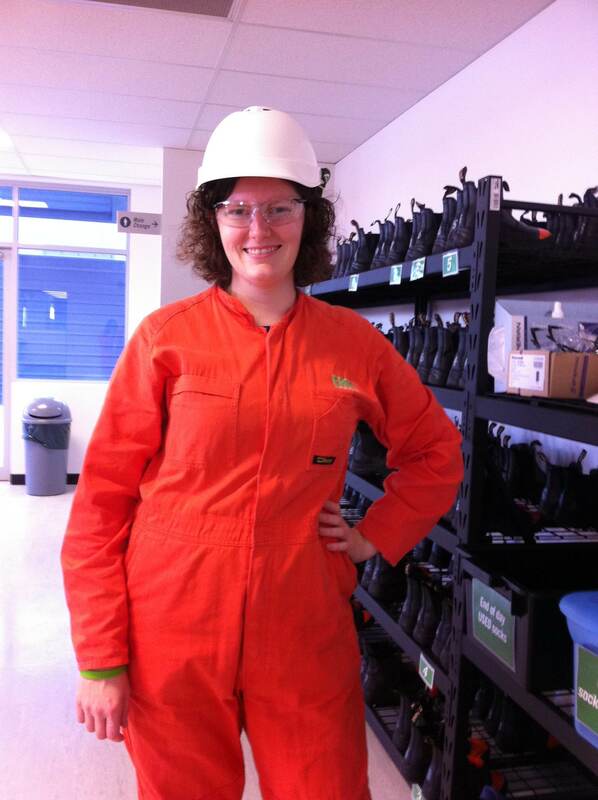 We arrived and got kitted out in our ‘work gear’, as ERGT want you to be ‘in the zone’ during your training (bonus points: we totally rocked the orange boiler suits). The morning was full of theory about how to evacuate an offshore facility and different strategies for survival following abandonment. We learned about different methods for getting off the facility, from the preferred (walking off and onto a jetty) to the emergency exits (lifeboat or liferaft) to the last chance (jumping off). Johanne, the Instructor / Eye-Candy, explained different types of lifeboat and liferaft (note: the former is an actual vessel which you’ll probably do alright in, the latter is essentially an inflatable tent) and how to deploy them. He also explained how to put on a lifejacket, the best way to enter the water (watch the horizon, use your hand to block off your nose and mouth, straight legs), and how to adopt the HELP position to minimise rate of hypothermia once in the sea. But it was actually really good fun! First we had a mock evacuation drill – the sirens went and we had to grab our lifejacket and hardhat, reach the muster point and enter the lifeboat. This was then actually descended from three storeys into a small pool, which was quite a weird experience. After that, we went to worst case scenario. We went up to the first platform (thankfully only 1m above the pool rather than the next one at 4.5m!) and Johanne explained again how to jump in. At this stage, all the big burly riggers who had been standing next to the edge suddenly disappeared to the back of the group, leaving me to go first! Nice to know chivalry isn’t dead… We tried the HELP position, practiced coordinating as a group, and did drills of saving each other from burning oil platforms (even if some of us dragged our victims towards the platform instead *cough Angela cough*). Then we had to try getting into a deployed liferaft from the water. Despite Johanne’s instruction of ‘one at a time’, all the riggers dashed off towards the raft together. What happened to ladies first?! Once we were all in the raft, we got airlifted to safety – a loop was descended from the higher platform, which we put under our arms and we got lifted up – much to the amusement of the riggers, as we dangled mid-air! On Thursday and Friday we attended an Apply First Aid course with St John Ambulance Australia. 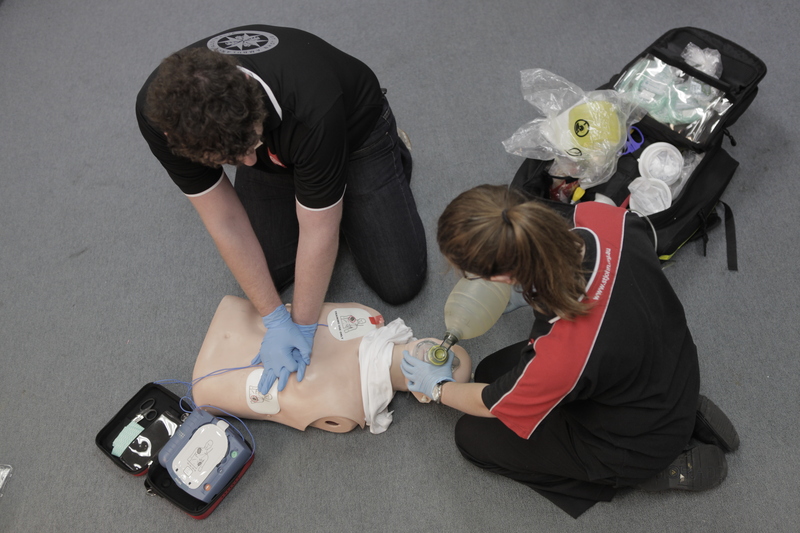 This course covers a wide range of topics, including CPR, the Recovery Position, Defibrillation, Choking, Severe Bleeding, Allergic Reactions, Shock, Burns, Animal Bites, Fractures, Heat-Induced Conditions, and lots more. Very comprehensive! The instructors, Mike and Brooke, were fantastic with a wealth of knowledge and experience to share with the class. Angela and I had great fun bandaging each other up and practising different first aid scenarios, even if she did get a bit over-enthusiastic… When I was pretending to have an allergic reaction she grabbed the fake epi-pen and, with a cry of “I’ll save you Saz!”, stabbed it into my leg with enough force to leave me numb all morning! But one of the things that surprised me on this course was the number of people doing it for the first time. I am pretty accident-prone (see falling off cliffs above! ), and have been very lucky in that I have usually had someone with some kind of first aid knowledge nearby to sort me out. Even when this wasn’t the case, I’ve been able to self-administer first aid thanks to completing several courses before. When asked why they have never done a course like this before, most people in the class said they were scared of being in an emergency situation and doing the wrong thing. But, as the instructors pointed out, I would feel far worse seeing someone in desperate need and being unable to do anything to help them. If someone is hurt or unconcious, they are already in a bad situation – it is highly unlikely that you could do anything to make things worse. But by trying to help and offering first aid, you are giving them a chance. The leading cause of death in Australia involves heart-related conditions, mostly heart attacks when breathing stops and the heart ceases to pump blood. On average, it will take 20mins for an ambulance to arrive – but within 3-5mins, your brain will start to die from lack of oxygen. If you can perform CPR for just quarter an hour, you significantly improve the victims chances of survival. If you have never done this, or if it has been a while since the last one, please go do a first aid course. St Johns Ambulance offer a wide range of courses at varying prices. If you are a student, check what’s available through the university – I know that Curtin University and the University of Western Australia here in Perth both offer discounted courses to students. It looks good on your CV, it’s fun to do, and if you can think of at least one person you wouldn’t want to lose, then you owe it to them to know what to do in an emergency. Hopefully you’ll never have to do so, but if you did – what would you do? This entry was posted in Personal on August 25, 2013 by Sarah Marley.